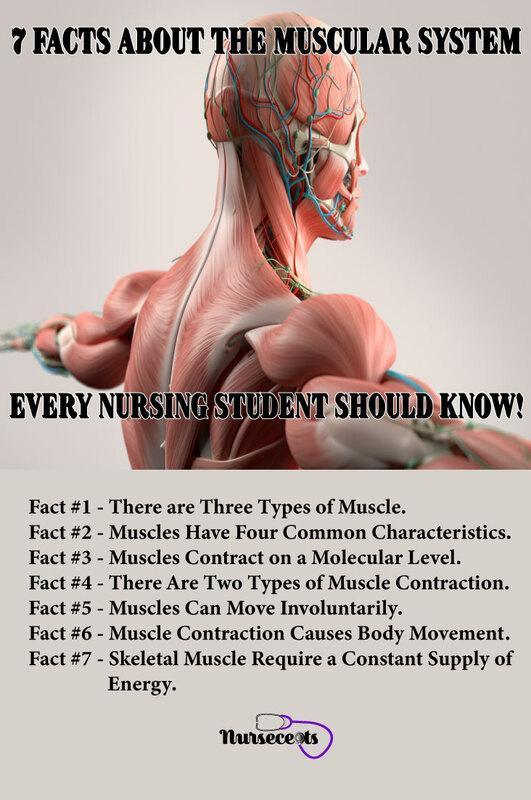 7 Facts About the Muscular System Every Nursing Student Should Know. The muscular system provides the body with mobility. There are over 600 muscles in the body. This system helps us walk, run and lift objects. 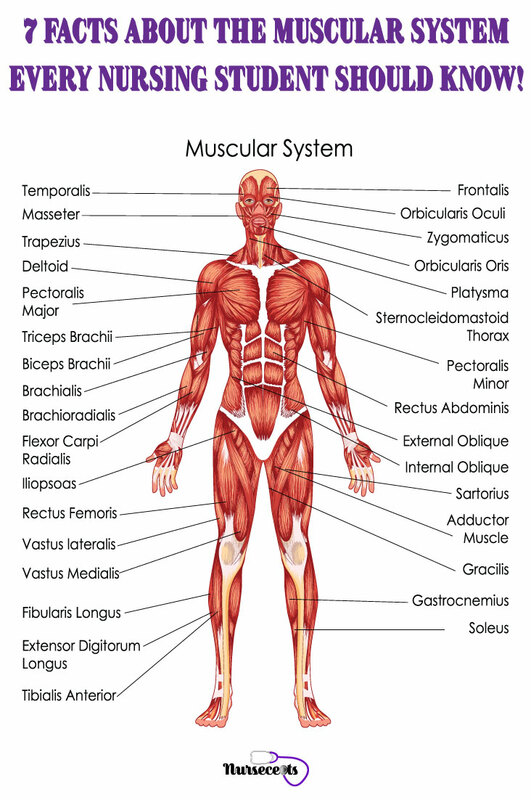 The muscles of the muscular system not only allow for external movement but also internal movement as well. Each muscle is a separate organ encased in connective tissue called fascia. The muscles of the body come in many shapes and sizes. Muscle tissue has the ability to shorten or thickened in response to a nerve impulse. Also, muscle tissue will relax back to its normal state. Movement is the result of the relaxation and contraction of the muscle. 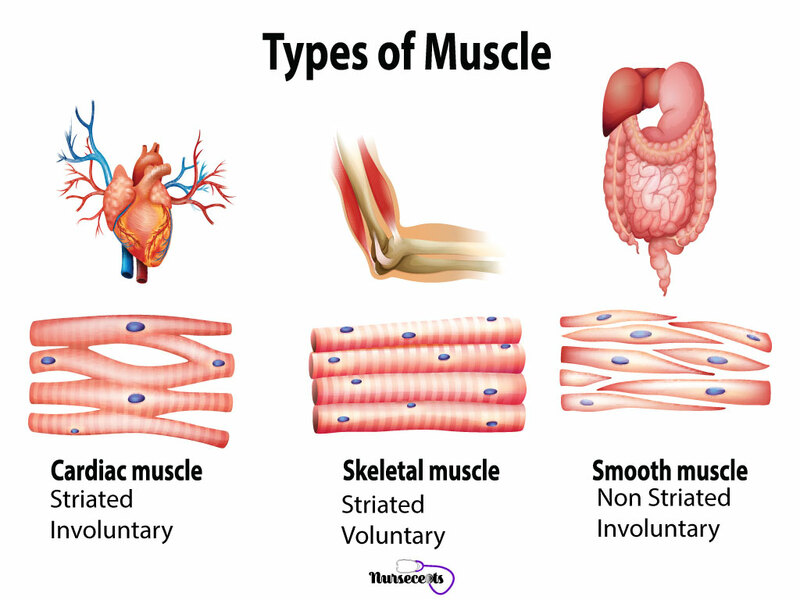 This article will look at the types and characteristics of muscles. Also, it will cover voluntary and involuntary muscle contraction. Finally, this article will review the different types of movement caused by muscles and the energy requirements of the muscles. 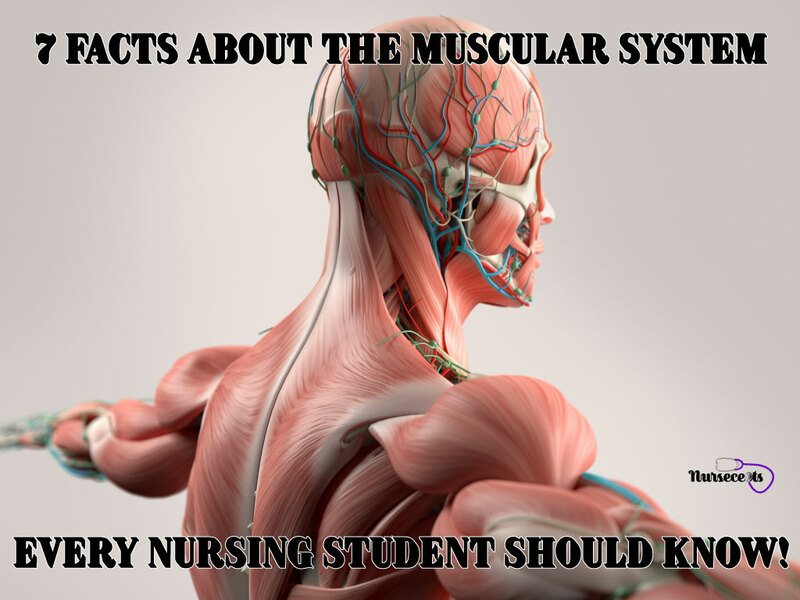 This article contains 7 Facts about the Muscular System Every Nursing Student Should Know. Fact #1 – There are Three Types of Muscle. 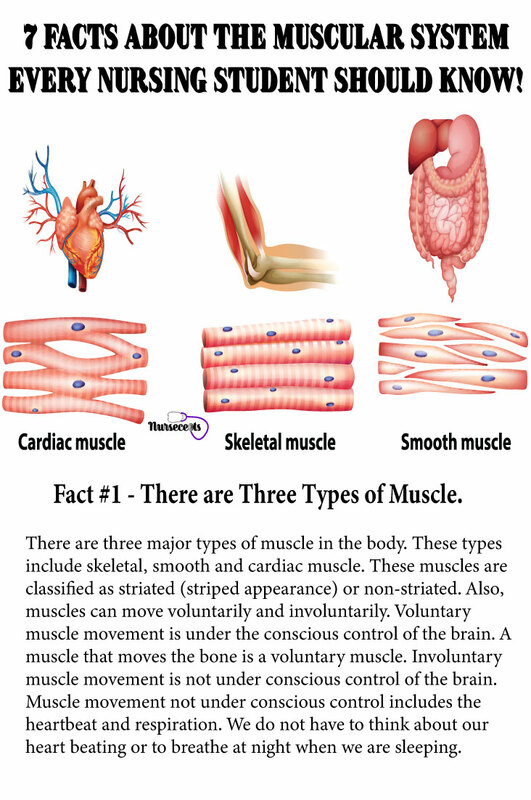 There are three major types of muscle in the body. These types include skeletal, smooth and cardiac muscle. These muscles are classified as striated (striped appearance) or non-striated. Also, muscles can move voluntarily and involuntarily. Voluntary muscle movement is under the conscious control of the brain. A muscle that moves the bone is a voluntary muscle. Involuntary muscle movement is not under conscious control of the brain. Muscle movement not under conscious control includes the heartbeat and respiration. We do not have to think about our heart beating or to breathe at night when we are sleeping. First, there is skeletal muscle. Skeletal muscle controls the voluntary muscle movements of the body. Also, skeletal muscle has a striated appearance. Skeletal muscle gets its name because it attaches to the bone (skeleton) via tendons and ligaments. The location of skeletal muscle is right beneath the skin. This is the muscle that develops with exercising and lifting weights. Skeletal muscles control external movement such as running, walking and lifting. These muscles can be controlled to exert a large amount of force or a very small amount of force. Second, there is smooth muscle. Smooth muscle is involuntary and not under conscious control. Unlike skeletal muscle, smooth muscle is non-striated. The location of smooth muscle is in the organs of the body such as the digestive system, the airways and also blood vessels. This muscle is also known as visceral muscle because it is found in the organs. Visceral pertains to the organ or to the organs of the abdominal cavity. Smooth muscle controls peristalsis in the digestive system and the movement of the lung on inhalation and exhalation. Also, the smooth muscle controls the change in the diameter of the blood vessels – vasoconstriction and vasodilation. Finally, there is cardiac muscle. Cardiac muscle is striated like the skeletal muscle and involuntary like the smooth muscle. This type of muscle is only in the heart. The location of cardiac muscle is in the walls of the heart. Cardiac muscle is responsible for the contraction of the heart. Contraction of the heart causes blood to move through the body. Fact #2 – Muscles Have Four Common Characteristics. All muscles have four characteristics in common. Those characteristics include contractility, extensibility, elasticity, and excitability. 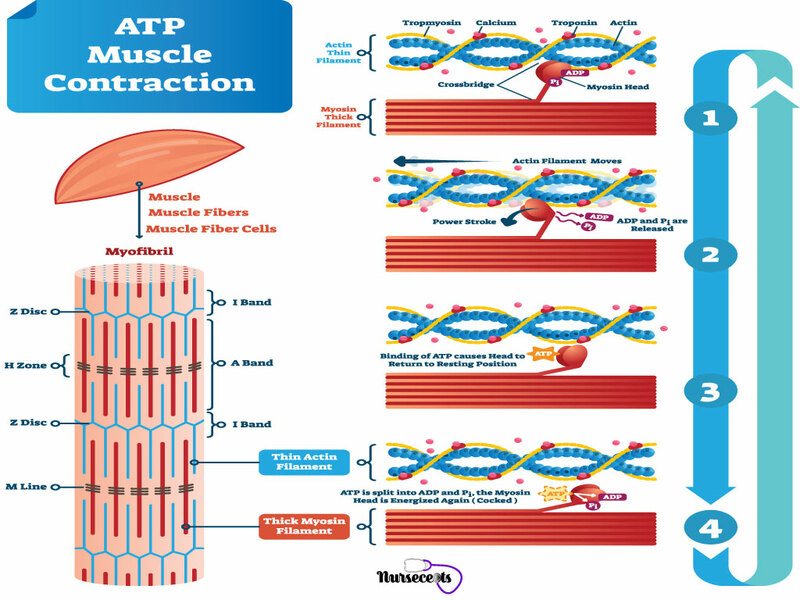 Contractility is the ability of a muscle to contract when the actin and myosin filaments slide across each other. A contraction is a reduction in the size of the muscle fibers. Extensibility is the ability of the muscle to stretch. A muscle must have extensibility for movement to occur. Elasticity is the ability of the muscle to return to its original position. Once a muscle stretches it needs the ability to return to its original shape. Excitability is the ability of the muscle to respond to stimuli. Muscles movement occurs in response to nerve impulses. 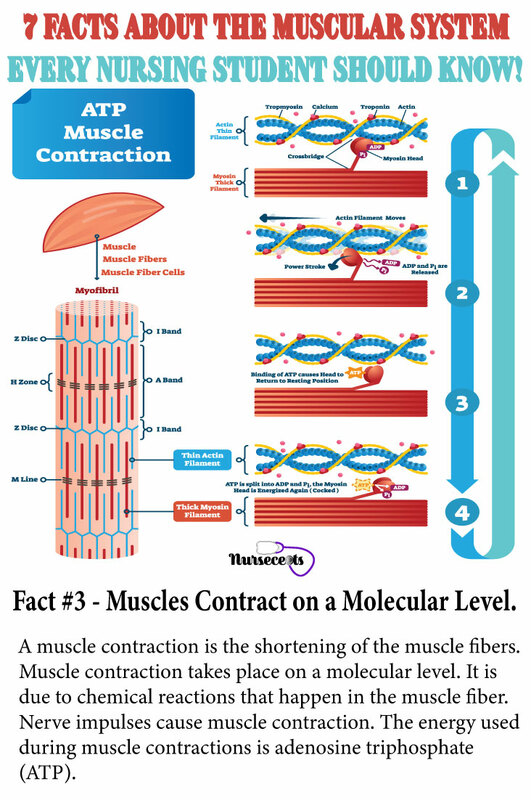 ￼Fact #3 – Muscles Contract on a Molecular Level. A muscle contraction is the shortening of the muscle fibers. Muscle contraction takes place on a molecular level. It is due to chemical reactions that happen in the muscle fiber. Nerve impulses cause muscle contraction. The energy used during muscle contractions is adenosine triphosphate (ATP). Calcium is also needed for muscle contraction. Muscle consists of bundles of muscle fibers. 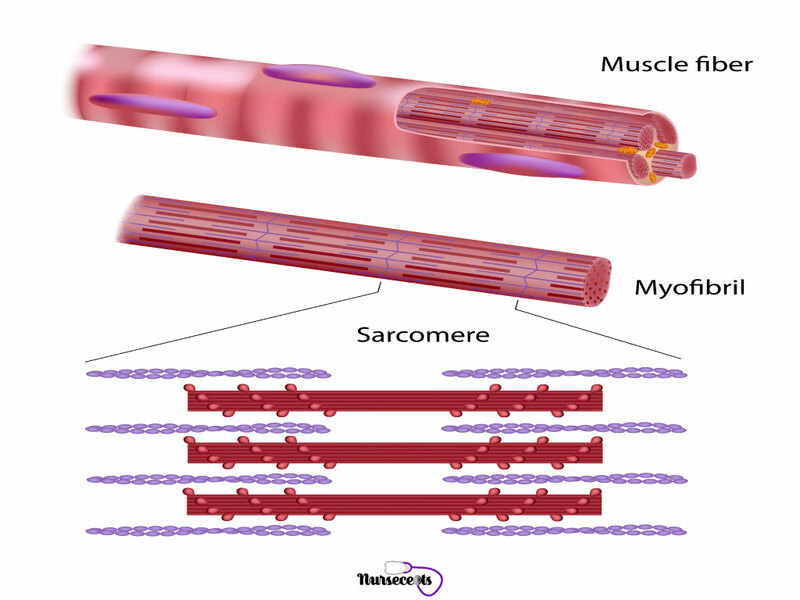 The contractile unit of the muscle fiber is the sarcomere. Each sarcomere has two myofilaments consisting of the proteins actin and myosin. During relaxation, calcium is stored away from the actin and myosin filaments in the sarcoplasmic reticulum. Calcium releases with the stimulation of the muscle by nerve impulses and allows the ATP, the myosin and the actin to interact. The myosin forms a chemical bond with the actin. The actin and myosin proceed to create and break bonds over and over again. The bonds create and break over and over as the myosin filaments move up the actin filament with a ratchet type movement. This movement causes the sarcomere to shorten and become fatter. When there is no longer stimulation, the calcium returns to the sarcoplasmic reticulum and the chemical bond between the myosin filament and the actin filament ceases. Once the bonds are broken, the muscles relax and return to normal position. Fact #4 – There Are Two Types of Muscle Contraction. The two types of muscle contraction are isometric contraction and isotonic contraction. Isometric contraction is when the length of the muscle remains constant and the tension produced by the muscle increases. During an isometric contraction, the joint does not move. An example would be to push your arm against a wall. Isotonic contraction is when the muscle moves or shortens and the tension remains the same. During an isotonic contraction the joint moves. An example would be if you flexed your forearm. Most movements are a combination of isometric and isotonic contraction. Fact #5 – Muscles Can Move Involuntarily. Smooth muscles and cardiac muscles are both involuntary muscle which is not under conscious control. Nerve impulses from the autonomic nervous system control the smooth and cardiac muscles. Smooth muscle is responsible for functions such as peristalsis in the digestive tract. And, cardiac muscle is responsible for the contractions of the heart. Smooth muscle is found in the digestive system, the airways and blood vessels. The ability of the smooth muscle to expand and contract is important. The construction of smooth muscle units is much looser than skeletal muscle units. The units of smooth muscle form flat bands. These muscle cells consist of bundles of actin and myosin that taper at both ends. Also, each smooth muscle cell has a nucleus. Like the skeletal muscle, the movement of smooth muscle is due to the movement of the actin and myosin filaments. The movement of smooth muscle is slower than skeletal muscle. And, the contraction of the smooth muscle occurs in different portions at different times. For example, during peristalsis one portion of the bowel will contract while the other portion is relaxed. That portion will relax while another portion contracts to cause the movement of food through the digestive tract. Additionally, the ability of the blood vessels to expand and contract enables them to vasodilate and vasoconstrict. This helps the body to control the blood pressure. Cardiac muscle is found in the walls of the heart. The contraction of the cardiac muscle causes the ejection of blood from the heart which circulates throughout the body. Cardiac muscle is striated like skeletal muscle but has a different shape. These cells are shorter and divide at the ends. The fiber attaches to the fibers besides them which create a network that makes the muscles stronger and tougher. The heart muscle needs to be tough to continuously beat throughout a lifetime. Just like the skeletal, and smooth muscles, the movement of cardiac muscle is due to the movement of the actin and myosin filament and controlled by electrical impulses. 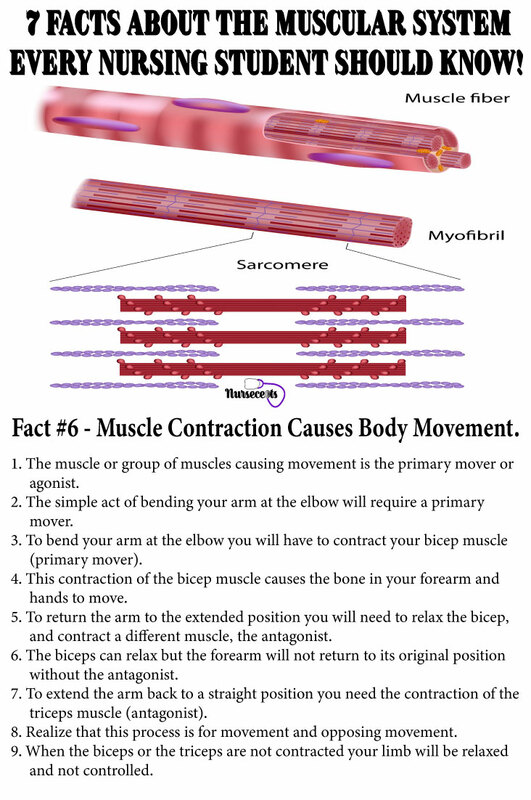 Fact #6 – Muscle Contraction Causes Body Movement. Muscle contraction produces movement of the body. One muscle or a group of muscles can cause movement. The contraction and relaxation of different muscles cause movement and an opposite movement of body parts. The muscle or group of muscles causing movement is the primary mover or agonist. The simple act of bending your arm at the elbow will require a primary mover. To bend your arm at the elbow you will have to contract your bicep muscle (primary mover). This contraction of the bicep muscle causes the bone in your forearm and hands to move. To return the arm to the extended position you will need to relax the bicep, and contract a different muscle, the antagonist. The biceps can relax but the forearm will not return to its original position without the antagonist. To extend the arm back to a straight position you need the contraction of the triceps muscle (antagonist). Realize that this process is for movement and opposing movement. When the biceps or the triceps are not contracted your limb will be relaxed and not controlled. The muscles attached to a bone can cause several types of movements. The movements include abduction and adduction, extension and flexion, pronation and supination, inversion and eversion, dorsiflexion and plantar flexion. Other movements include hyperextension, circumduction, and rotation. Abduction is the movement away from the middle of the body. To perform abduction, stand with your arms at your side and lift one arm away from the body to the side. Adduction is the movement toward the middle of the body. To perform adduction, move that same arm back to your side. To help remember the differences think of adduction as adding your arm to your body by moving it toward the middle of the body. Extension and flexion relate to the increasing and decreasing of an angle between two bones such as a joint. The extension is the straightening of the angle at the joint. Flexion is the opposite of extension. Flexion is the bending at the joint to create an angle. An example of extension and flexion would be the straightening and bending of the knee. In positioning a patient, they can be placed in the prone position. The prone position is when a patient is lying on their stomach so that the front of the body is facing down. Therefore, pronation is when the forearm or hand turns so the palm of the hand is facing downward. The supine position is when a patient is lying on their back so that the front of the body is facing up. Therefore, supination is when the forearm or hand turns so that the palm of the hand is facing upward. An example of inversion and eversion occurs at the ankle joint. Inversion is the movement of the sole of the foot inward toward the middle of the body. Eversion is the movement of the sole of the foot outward away from the middle of the body. When you think of INVERSION, think of INWARD. An example of dorsiflexion and plantar flexion occurs with the foot. Dorsiflexion is the bending of the foot upward toward the shin. Plantar flexion is when the toes are pointed. Hyperextension is an exaggerated version of an extension. A person can hyperextend their cervical vertebrae. This occurs when a person looks up at the ceiling. Circumduction is moving in a circular motion. An example would be making a circle with your arm rotating the shoulder. Rotation is turning a body part on an axis. An example is turning your head from left to right. Fact #7 – Skeletal Muscle Require a Constant Supply of Energy. Just like all other tissue, muscles need fuel to function and to survive. Skeletal muscle requires a constant supply of adenosine triphosphate (ATP) for muscle contraction. Cellular metabolism creates the synthesis of ATP. ATP aids in the bond of the actin and myosin filaments. However, this energy source depletes rapidly and needs constant renewal. Anaerobic glycolysis and aerobic glycolysis both produce ATP. Glycogen is always waiting and ready for conversion into an energy source. The muscles of the body store carbohydrates in the form of glycogen. Muscles can convert glycogen into glucose. Therefore, when the demands on the muscle are brief, glycogen converts anaerobically (without oxygen) to glucose in order to sustain the activity. This process is anaerobic glycolysis. This method of glycolysis is less efficient than aerobic glycolysis. This method uses more glycogen to produce the same amount of ATP. A by-product of anaerobic glycolysis is lactic acid. Lactic acid builds up in the muscles and causes the muscle to become weakened and fatigued. 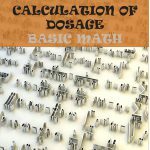 Additionally, there is a need for oxygen to convert the lactic acid back to glycogen. The body produces this oxygen by increasing the rate of breathing and the heart rate. When the body performs strenuous exercise and the need for more energy arises, there is the activation of aerobic glycolysis. Also, during this time when the requirements of oxygen increase, there is the mobilization of free fatty acids to assist. Free fatty acids can be used as an immediate source of energy. Aerobic glycolysis provides ATP over a longer period of time. Aerobic glycolysis requires oxygen to maintain strenuous activity. When the production of ATP from aerobic glycolysis becomes exhausted, the muscles become weak and exhausted. At this time lactic acid begins to build up in the muscles. When maximal muscle exertion is sustained, the muscle creates an oxygen debt. This is the amount of oxygen the body needs to convert lactic acid back to glycogen and replenish the ATP stores. The muscular system contributes to the mobility inside and outside the body. This system helps us walk, run and lift objects. The muscular system works in coordination with the skeletal system. Therefore a problem with the muscular system can adversely affect the skeletal system. This article covers types of muscles, the characteristics of muscles and the movement allowed by the muscle. An additional article that is great to read with this one is 9 Facts About the Skeletal System Every Nursing Student Should Know. These two articles will help with your understanding of mobility in the human body. Next Post9 Facts About the Skeletal System Every Nursing Student Should Know.